Cucumbers belong to the melon and squash family. These healthy vegetables are relatively easy to grow. You will even find that growing cucumbers in containers is easy too and usually thrive under the right conditions. If you are a first-time gardener and want to start out growing a veggie that requires very little intervention on your part, why not give cucumbers a try! Cucumbers are easily recognizable by their elongated shape and dark green coloring. They taste great and are also good for you as they contain vitamins such as A and C and also have high water content. This article offers tips on growing cucumbers in containers. 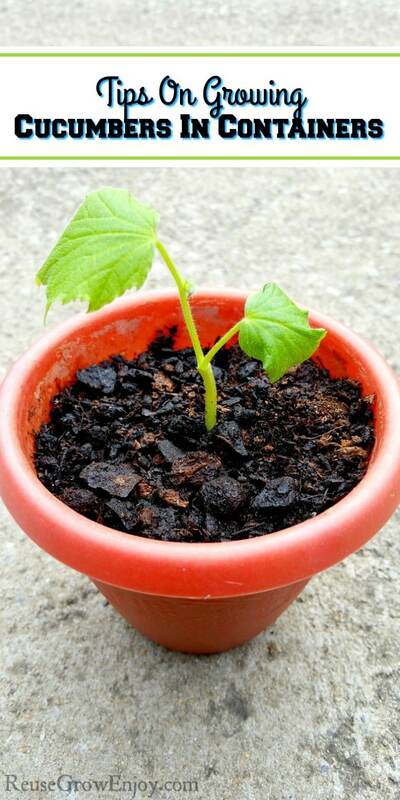 While some people suggest that it is easier for first-time container gardeners to start out with young plants (or seedlings) when you are new to gardening this is not always the case. It is not difficult to start your cucumber plants right from seeds. You can sprout the seeds indoors if the weather is still too cool to place them outdoors. If all danger of frost has passed then you can sow the seeds directly outside in full sun. It just takes a little longer than starting from a seedling. An old egg carton is great for sowing cucumber seeds. Poke holes in the bottom of each section of the carton for drainage purposes and then fill with potting soil. Place one or two cucumber seeds in each segment keeping in mind that cucumber plants generally yield high quantities of fruit. First-time gardeners may want to limit the number of seeds that they start out with. Cover the seeds with about a quarter inch of soil and water thoroughly. Try not to let the soil dry out completely when attempting to sow cucumber seeds. Check the soil daily and add more water when necessary. But you also want to make sure not to keep them super wet either. You want the soil to be just slightly moist when growing cucumbers in containers. After about a few days you should see tiny green leaves poking up through the soil. Sometimes the seed will still be attached. As the seedling begins to get larger the germinated seed will eventually drop off. The first two leaves to appear on a cucumber plant are oval shaped. Transplant these seedlings to the intended container quickly to give adequate space for the development of the plant’s root system. If you have space, you can start your seeds in the same pot that you will be using for growing cucumbers in containers. These plants enjoy 6+ hours of full sun each day whenever possible. They like warm weather and can tolerate relatively high temperatures. However, if temperatures reach higher than 85 degrees frequently in your area then you may want to place pots in a spot that gets some shade during the hottest part of the day. The leaves of cucumber plants can grow to be quite large and when they are receiving enough sunlight they have a rich green appearance. If you will be growing indoors and the plants will not have enough sunlight, you can also use grow lights. According to the University of Illinois Extension’s Watch Your Garden Grow, “cucumber plants have shallow roots and require ample soil moisture at all stages of growth”. Water your plants frequently when the weather is extremely dry. You may not have to water as often if it has been raining a lot, just remember that pots do not catch as much water as the ground. Pay close attention to the plants when you are growing cucumbers in containers, they will let you know if they are happy! Add plant food according to the package directions (which is generally once a week) and also consider adding your own organic materials to the soil. 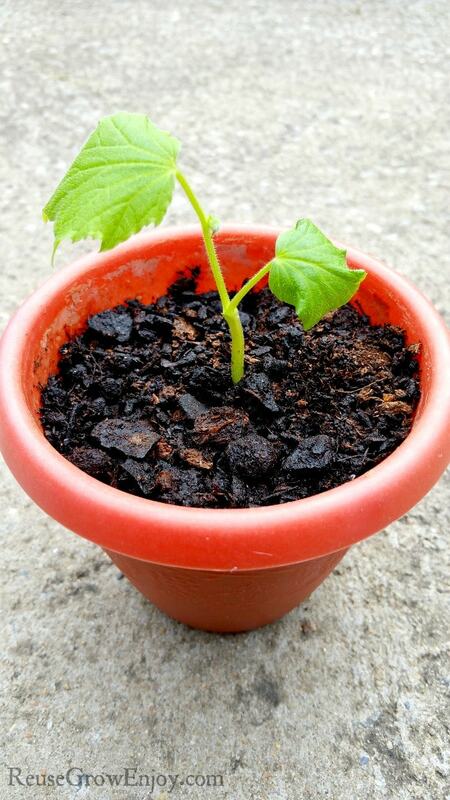 Cucumber plants are nitrogen loving and you can add freshly used coffee grounds for this purpose. Add a tablespoon or two around the base of each plant. You can also add crushed egg shells (which add calcium). Read up on these types of soil enhancing techniques before trying anything new and to find out the suggested frequency. The leaves of cucumber plants can develop burn spots when given too much fertilizer and fruit production can also be impacted. Cucumber plants grow very quickly along the ground. It is a good idea to train them to grow on a trellis of some kind. You can build one or go to your local home and garden store or online to pick something out that will be suitable for your needs. Growing on trellis works well when growing cucumbers in containers as it saves on ground space that you may not have when growing indoors or on a patio. After a few weeks, you will probably notice vibrant yellow flowers appearing amongst the leaves of the plant. These flowers are very pretty and can brighten up any garden. Those new to gardening may be surprised to find out that cucumber plants produce separate female and male flowers. The male flowers generally develop first followed by the female flowers. Some of the male flowers fall off pretty quickly but do not be alarmed. Keep watering and pretty soon you should see tiny spiky cucumbers developing behind many of the female flowers! If you are growing cucumbers in containers outside, you don’t have to do anything to pollinate the flowers as nature will take care of it. But if growing indoors, you will need to either take a small dry paintbrush and touch it to the inside of the flowers and then touch it to the other flowers. Or you can also put a small fan to blow on it for 10 – 15 minutes per day to pollinate. Continue to monitor your plants closely as the tiny cucumbers begin to increase in size and pretty soon you should be ready to harvest your first crops as a first-time container gardener! If you found this helpful, here are some other posts to check out. Never miss a post, sign up for my free newsletter!